R.L. Drake was founded in 1943 by Robert L. Drake, a young engineer with a significant background in radio design for major industry concerns. The company began as a manufacturer of low pass and high pass filters for the government and amateur radio market. After World War II, the company applied its engineering expertise to the consumer market and started producing amateur or “ham” radio transmitters and receivers. The company’s amateur products soon became known as the “Cadillacs” of the ham radio field. Many of the Drake receivers, transmitters, and transceivers manufactured in the fifties, sixties, and seventies are still in active use today. Collectors and Drake aficionados will often pay twice the original market price to add such an item to their “Ham Shack”. Drake expanded their product line with marine radios and other reception hardware. In 1981, Drake investigated the then semi-hobbyist field of home satellite reception equipment. Drake engineers, under the leadership of founder’s son Peter Drake, completed a prototype satellite receiver in just four months. The demand for satellite receivers in the 1980s was overwhelming, convincing Drake to manufacture commercial satellite receivers and distribution equipment, as well as reception equipment for the international marketplace. In 1997 Drake brought its expertise in the RF communications field to the assistive listening market. The transmitter/personal receiver system was put into production to help the hearing impaired participate in venues where traditional hearing aids amplify all sounds, causing distortion or reverberation of the source audio. In 1998 Drake introduced video modulators in miniature. 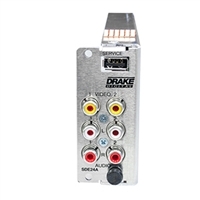 Having produced 19 inch rack equipment for the CATV industry for several years, Drake sensed the need for smaller equipment, as cable “head-ends” are typically remote buildings where space is a commodity. Today, Drake makes it easy for cable operators to plan and deploy digital solutions. Working with major content providers, Drake provides a comprehensive digital offering that comes pre-configured for plug-and-play capability.